Value Design - Our new radial offers motorists a value choice in the most popular sizes. All-Weather Tread - Tread elements form an effective pattern of distinct gripping edges for year round traction. Wide circumferential grooves and lateral slots help promote excellent wet traction by channeling water and slush out from the contact patch. Stiff Lower Sidewall - A hard bead filler is reinforced with a rim cushion to surround the bead area with stiff support. 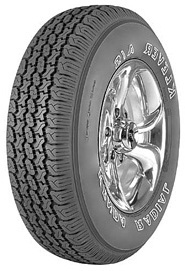 A rigid lower sidewall enhances handling and stability.